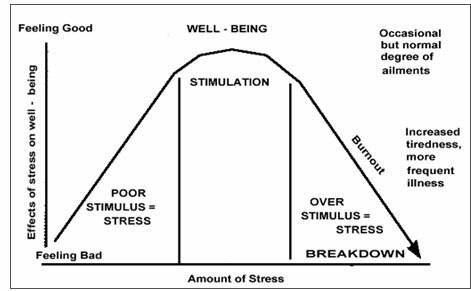 Stress has been described over or lack of stimuli. Too little can lead to depression, lethargy, feelings of being devalued and lack of focus. Conversely, too much stress can lead to exhaustion “burn out” or even “nervous breakdown”. Yoga, on the other hand minimizes impact of stress on the individual. Yogic science believes that the regular practice of asanas and pranayama strengthens the nervous system and helps people face stressful situations positively. Tension, is not a modern phenomenon. In the centuries-old yoga Sutras, the sage Patanjali attributed the causes of mental affliction to the ego, spiritual ignorance, desire, hatred of others, and attachment to life. He called these kleshas or “sorrows”. Through advances in science and technology, modern civilization has been able to conquer ignorance in many fields, but its pride in technological achievement is excessive and misplaced. It has triggered widespread feelings of competitiveness and envy. Financial tensions, emotional upheavals, environmental pollution and, above all, a sense of being overtaken by the speed of events, have all increased the stress of daily life. All these factors strain the body, causing nervous tension, and adversely affecting mind. This is when feelings of isolation and loneliness take over. To deal with this, people turn to artificial solutions to cope with the pressures of daily life. Substance abuse, eating disorders, and destructive relationships are some of the substitutes people grasp at in their desperate search for consolation. But while these measures may provide temporary distraction or oblivion, the root cause of unhappiness – stress – remains unresolved. Yoga is not a miracle cure that can free a person from all stress, but it can help to minimize it. The worries of modern life deplete our reserves of bio – energy, because we draw on our vital on our vital energy from the storehouse – the nerve cell. This can, ultimately, exhaust our energy reserves and lead to the collapse of mental and physical equilibrium. In yoga, experience of relaxation means moving from the outside to the inside, becoming aware of this introversion and maintaining balance and stability. Yogic science believes that the nerves control the unconscious mind, and that when the nervous system is strong, a person faces stressful situations more positively. 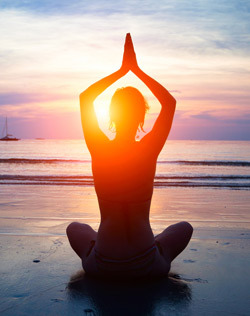 Asanas improve blood flow to all the cells of the body, revitalizing the nerve cells. This flow strengthens the nervous system and its capacity for enduring stress. The diaphragm, according to yogic science, is the seat of the intelligence of the heart and the window to the soul. During stressful situations, however, when you inhale and exhale, the diaphragm becomes too taut to alter its shape. Yogic exercises address this problem by developing elasticity in the diaphragm, so that, when stretched, it can handle any amount of stress, whether intellectual, emotional, or physical. The muscles also accumulate stress because when there is no movement of the body then a chemical accumulates called lactic acid. At night when you sleep your body generates lactic acid which causes the feeling of stiffness when you wake up in the morning. When there is a movement for some time then that stiffness slowly fades away. The toxins which accumulate in the joints prevent free movement. The adjoining muscles also have minute spaces in which circulation stagnates. So yogic postures stretch the muscles and expand the joints. As a result circulation improves and toxins are drained away. Some useful practices which take only a short time are thehead and neck movements. Yoga has been found to be an effective therapy to increase the immunity, the stamina and the strength of the different systems within the body. Yoga also does not consider the mind as everything, but it accepts that by developing awareness and concentration you can awaken the dormant potential which can be used to develop and attain success in your life. 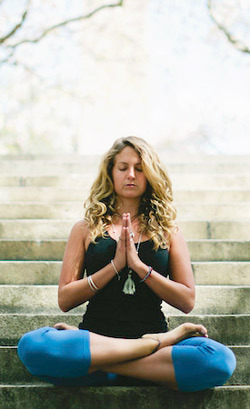 The practice of asanas and pranayama helps to integrates the body, breath, mind, and intellect. Slow, effortless exhalation during practice of an asana brings serenity to the body cells, relaxes the facial muscles, and releases all tension from the organs of perception: the eyes, ears, nose, tongue, and skin. A good starting point and a difficult one, is to be sober and clean, living a life free from drug use or drink. When this happens, the brain, which is in constant communication with the organs of action, becomes shunya, or void, and all thoughts are stilled. Then, invading fears and anxieties cannot penetrate to the brain. When you develop this ability, you perform your daily activities with efficiency and economy. You do not dissipate your valuable bio-energy. You enter the state of true clarity of intellect. Your mind is free of stress and is filled with calm and tranquility. The importance of relaxation in our society is vital to health and well being and body “ease”. A body in a constant state of arousal eventually becomes exhausted and “dis-eased”.